KARACHI/LAHORE: Various people took to social media to call for a tomato boycott after its prices have been skyrocketing for the past few weeks, being sold at Rs250 per kilo in various parts of the country. Consumers told Geo News that authorities have failed to keep a check on the prices which vary between Rs150 to Rs250 for tomatoes and Rs80 to Rs100 for onions. “Where we used to buy a kilo we are buying half a kilo now,” says a worried-looking woman at a grocery stall in Lahore. Another says that preparing a meal three times a day has become difficult as shopkeepers continue to sell grocery without a price card displayed. In Karachi, tomatoes are being sold between Rs160 to Rs200 per kilo. In the city’s biggest wholesale grocery market in Liaquatabad, tomatoes are being sold at Rs160. Price has gone up by Rs40 per kg. Shopkeepers in both cities say the prices have been affected due to limited supply from Afghanistan and Quetta, where winters have started. A carton weighing 15kg has gone up from Rs1,900 to Rs2,500 now, say vegetable sellers. “Increase in prices is a bigger headache for shopkeepers than customers,” a vegetable stall owner in Lahore claims. Consumers in Badin also expressed their annoyance at the increasing prices, calling for the local authorities to regulated prices. Various people on Twitter and Facebook have called for a boycott, ranging from three days to two weeks. “Everyone should boycott buying tomatoes for 2 weeks and use Yoghurt instead for curries- Price hike created by Tomato Mafia will come down,” a Twitter user quipped. 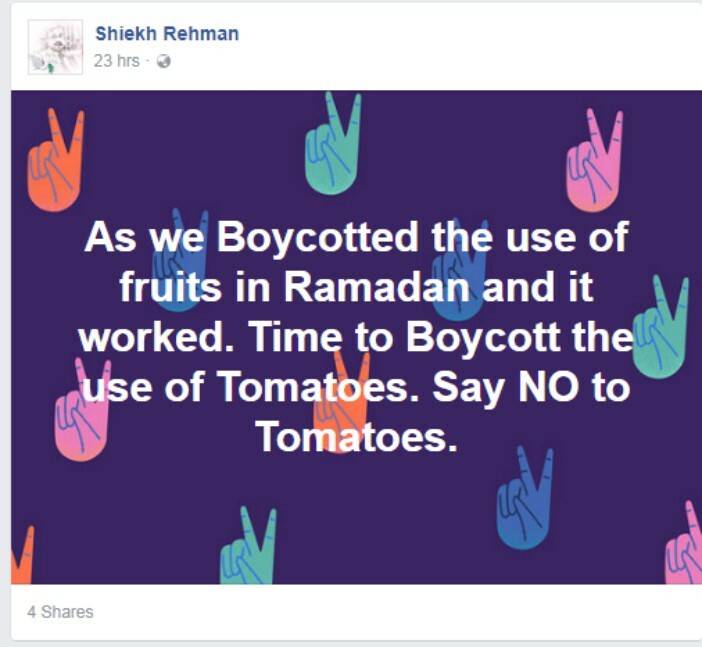 A social media campaign was launched by consumers in Ramazan to boycott fruits after prices went sky high. A three-day boycott was called, with people both supporting and severely criticising the boycott.